Isn’t it time to schedule your outdoor lighting maintenance? Our maintenance program ensures you enjoy all the benefits of your outdoor lighting all year-long! Choosing the right professional to service your lighting is just as important as the maintenance itself. It is crucial to entrust your lighting to an experienced outdoor lighting company. In much the same way you place your trust with right mechanic for your automobile maintenance, Outdoor Lighting Perspectives of San Antonio and the Hill County is the outdoor lighting company you can trust for all your outdoor lighting needs. We make sure all fixtures are correctly in place. 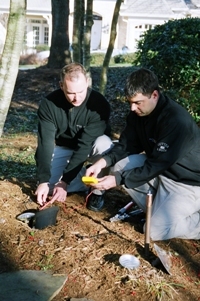 We offer the area’s most thorough outdoor lighting maintenance program. Our annual maintenance program is free during the first year with any full-service outdoor lighting installation. Following your first year of service we strongly recommend continuing with the program to ensure continuation of the full benefits of your quality outdoor lighting installation. We also offer this service to homeowners even if your lighting was installed by another lighting company. We inspect every aspect of your system to make sure it is operating in tip-top condition. Our maintenance program consists of thoroughly checking every aspect of your system on an annual basis. This detailed service includes bulb replacement, checking and repairing any damaged wire within the system, checking the transformer(s), straightening any fixtures that may have gone askew, checking and resetting timers, and trimming or adjusting the area for overgrown plants that may affect your system’s performance. Our continued service agreement ensures your lighting stays beautiful and worry-free all year. We can provide the maintenance in a convenient and timely manner, making your outdoor lighting maintenance one less thing you have to worry about this season! If you are ready to hand the headache of having to service your lighting over to the professionals, contact Outdoor Lighting Perspectives of San Antonio and the Hill Country today. We are full service outdoor lighting experts specializing in commercial and residential design and installation as well. We also service competitors’ lighting systems. You can see more images of our breathtaking outdoor lighting designs by visiting our outdoor lighting photo gallery located on our website. 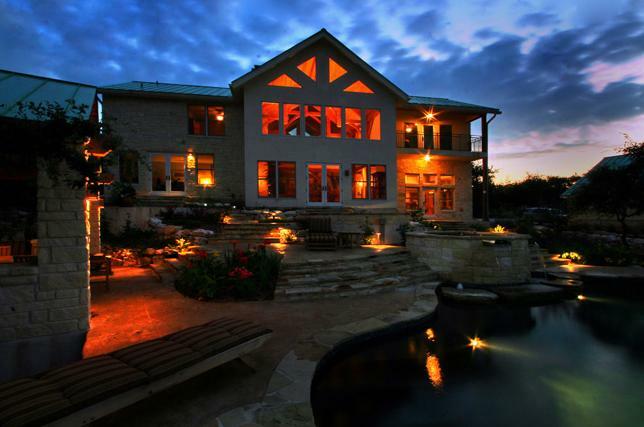 Beautiful Texas architecture comes to life with outdoor lighting from Outdoor Lighting Perspectives of San Antonio. Keep it running smoothly with our annual maintenance plan. Many homeowners choose to schedule their home and landscape maintenance during the fall as opposed to the spring. The cooler temperatures make the perfect time to perform those important household maintenance chores without having to break a sweat. Just as your A/C unit, smoke detectors and sprinkler systems need an annual “check-up”, your outdoor lighting system does too. Making sure your outdoor lighting system is in good working order will help keep operational costs low and ensure safety. Take the worry and headache out of maintaining your outdoor lighting system, let us take care of it for you. Choosing the right professional to service your lighting is just as important as the maintenance itself. 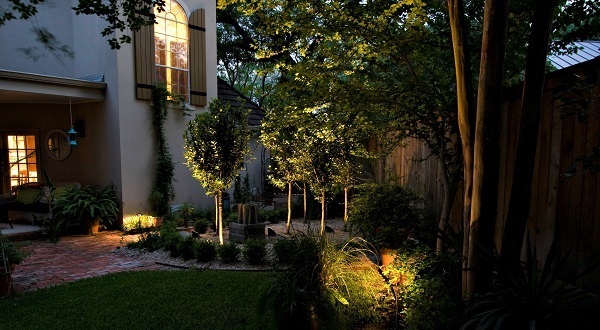 It is crucial to entrust your lighting to an experienced outdoor lighting company. In the same way you place your trust with right mechanic for your automobile maintenance, we are the outdoor lighting company you can trust for all your outdoor lighting needs. 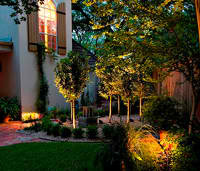 Outdoor Lighting Perspectives of San Antonio offers the most thorough outdoor lighting maintenance program in the area. Our annual maintenance program is free during the first year with any full-service outdoor lighting installation. Following your first year of service we strongly recommend continuing with the program to keep you enjoying the full benefits of your quality outdoor lighting installation. We offer this service to homeowners even if the lighting was installed by another lighting company. Our maintenance is the most thorough in the area. We check every facet of your system in detail. Our maintenance program consists of checking all aspects of your system on an annual basis. 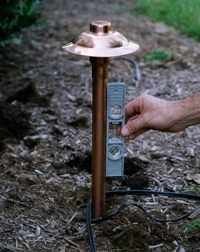 This detailed service includes bulb replacement, checking and repairing any damaged wire within the system, checking the transformer(s), straighten any fixtures that have gone askew, check and reset timers, and trim or adjust the area for overgrown plants that may affect your system’s performance. Our continued service agreement ensures your lighting stays beautiful and worry-free all year. We can provide the maintenance in a convenient and timely manner, making your outdoor lighting maintenance one less thing you have to worry about. Replace your own bulbs, or take the scheduled maintenance plan? Whether it’s for automobiles, home heating and air conditioning systems or landscape lighting systems, ROUTINE SCHEDULED MAINTENANCE is the key to keeping things running in tip-top shape. Be sure to use quality lamps (bulbs) with the same wattage and flood angle as those that came with your original installation. Of course, changing the bulb is only part of the periodic maintenance, and a complete inspection of the system should be accomplished at this time. Our service plan runs $19/fixture, and includes all the service mentioned above. When a homeowner is on our maintenance plan they only pay for the scheduled maintenance, and any additional service calls for system repair are free for the length of the plan. That means the $90 service call charge is waived! The Length of the maintenance plan is dependent upon how late each homeowner runs their landscape lighting system each night. These lengths equal the average service life of a 4000 hour quartz halogen bulb. When the typical service call costs $90, plus $19 per bulb replaced, you can see how quickly the costs can add up, which is why the Scheduled Maintenance Plan is easily the way to go! If you haven’t taken advantage of our Scheduled Maintenance Plan, call us today at 210-971-8759 and have your system brought back up to the level of performance you had when it was originally installed!